Last night, my favorite Oakland A’s player from my childhood announced his retirement. 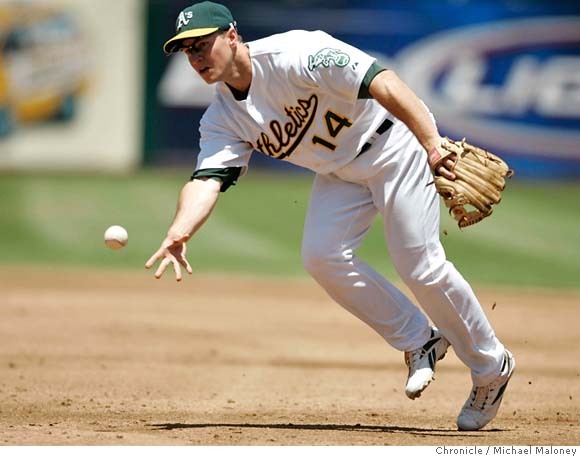 Mark Ellis joined the A’s in 2002 and was so consistently amazing with the team until his trade to Colorado in 2011. Even though he wasn’t a big name like Miguel Tejada or Erich Chavez, he stuck through some tough years for the team but remained professional. Drafted by the Royals in 1999, Ellis came to Oakland with Cory Lidle in a three-team trade in 2001 for Angel Berroa, A.J. Hinch, and Ben Grieve. What made him so endearing for me was that he always seemed to be clutch at the plate. But his offensive stats aren’t what made him a player with so much longevity, rather it was his defense. His .991 career fielding percentage is fifth best all time among second basemen. He even set a then record .997 fielding percentage in 2006. It still shocks me that he never won a Gold Glove in his career. In that 2006 season, Ellis unfortunately was injured and never got a chance to participate in the postseason run that year. He was part of a few runs early in his career with Oakland and enjoyed some success later on with the Dodgers and Cardinals. With the Dodgers, he remained as their starting second baseman and he was a great influence for a young team with a load of talent. He was a dependable veteran. I know I am bias, but the A’s should retire his number. Yes, I know there are way more talented players that have come through the A’s and have accomplished more, but Ellis is a rare breed of a player that was just consistent for so long and so good for the organization. One of my favorite moments was one I attended in San Francisco when Ellis got his 1,000th career hit. He wasn’t a big offensive player, but such an accomplishment was worth of celebration. I even took a video of it. There are so many great moments in his career for me as a fan. He had walk-off hits (I was there for this one), great defensive plays (like this) and was just a consistent fixture in the A’s lineup. He truly was great. Probably the best Mark Ellis story is the day he got traded. In fact, I was there when he got traded. It was Root Beer Float Day at the Coliseum and I was there. The news broke on Twitter that he had been traded. But Ellis was scheduled to make an appearance. And in the most professional way Ellis has endeared himself with the fans over the years, he stuck around the Coliseum and signed autographs even though he no longer had a legal obligation to with the team. He loved Oakland so much and I expect one day for him to return to be a coach. Photo I took of Mark Ellis doing his one final act for the Athletics: signing autographs for fans even after he was traded during Root Beer Float Day on June 30, 2011. Thank you, Mark. I remain a fan for life. This entry was posted in Colorado Rockies, Los Angeles Dodgers, MLB, Oakland Athletics, St. Louis Cardinals and tagged Mark Ellis. Bookmark the permalink.